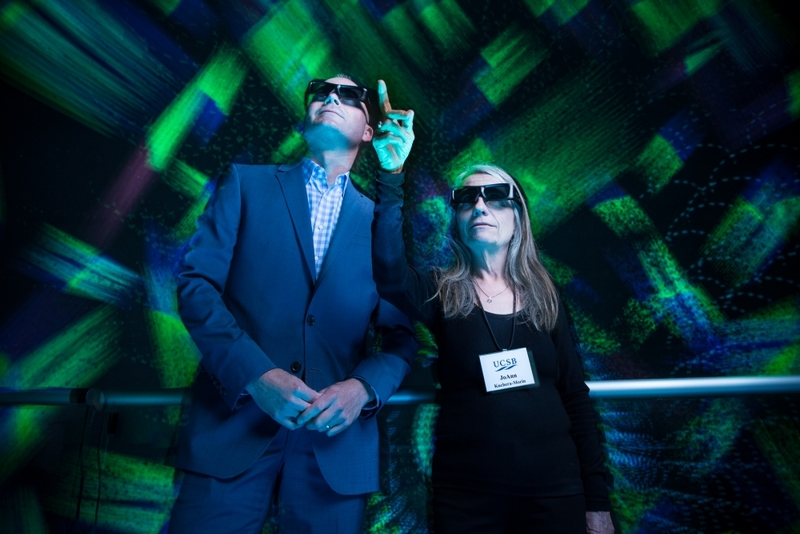 Steve Hinkley, left, of MOXI, The Wolf Museum of Exploration + Innovation, with UCSB’s JoAnn Kuchera-Morin, a professor of media arts and technology and founder/director of the AlloSphere. Spurred by a common mission of public service, and a mutual aim to foster public engagement with what’s known in education circles as STEAM (science, technology, engineering, arts and mathematics), UC Santa Barbara is teaming on a unique project with MOXI, The Wolf Museum of Exploration + Innovation. The innovative endeavor meant to give the community direct access to top-level arts and science is a joint effort of UCSB’s AlloSphere Research Group and Laboratory and the Media Arts and Technology (MAT) graduate program, and the new interactive science museum anticipated to open in downtown Santa Barbara in late 2016. 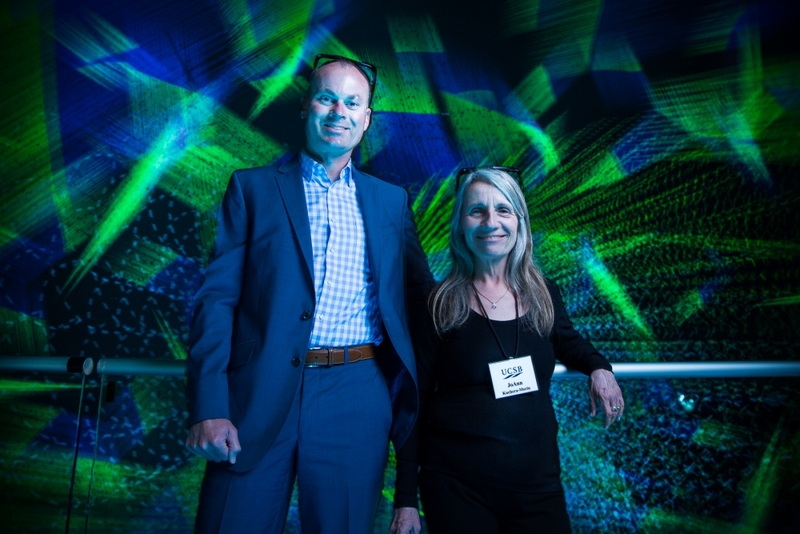 UCSB’s JoAnn Kuchera-Morin will direct the AlloSphere team in the design and creation of the first installation for the museum’s interactive media space, featuring her own “Hydrogen-Like Atom” installation, as well as other pieces. Steve Hinkley, MOXI’s president and CEO, concurred. The vision for the pilot outing is to grow the local STEAM community and test a collaborative model that potentially could be replicated by other programs at UCSB and other arts and service organizations on the Central Coast. The novel arrangement will see AlloSphere Research Group bring its deep expertise in teaching, curating and designing technology into MOXI’s dedicated, 1,000-square-foot media space by way of visual, aural and interactive content. And it will all be presented via a unique technology platform designed by Kuchera-Morin and her team expressly for the museum. That platform is being modeled on the AlloSphere itself — UCSB’s one-of-a-kind immersive, and massive, 3-D research lab. Built inside a three-story, nearly echo-free space, the 30-foot-diameter sphere simulates reality with its 360-degree projection of visual and aural data, sensing and camera tracking — Kuchera-Morin’s unique design. Able to represent phenomena and scales subatomic to universal, it allows for insights into places researchers can’t physically go, from a hydrogen atom to the human brain. It’s all in the interest of the two entities’ shared priorities of outreach, engagement and education for the community at large. “It’s a fairly lofty goal to be a museum of exploration and innovation, so we want to make sure we’re connecting to that, and nobody embodies it better than UCSB and the MAT team,” Hinkley said. “Hopefully what the AlloSphere group gains is a lab and a partner who is willing to experiment with them as they develop new technology, new techniques and new discoveries — and a place to test it.